With the exception of perhaps crocodiles and turtles, the attention devoted to the conservation of reptiles has for a long time lagged behind that devoted to birds and mammals. A recent study published in Biological Conservation, to which we contributed a small amount of data, has attempted to redress this conservation short-fall. The extinction risk was analyzed for a random sample of 1500 species (16% of all known species, which as of 2012 was > 9 500 spp.). The sample consisted of 58% lizards, 37% snakes, 3% turtles/tortoises, 2% amphisbaenians and <1% crocodiles (tuataras were not included) and this reflects the overall composition of the world’s reptiles. IUCN Red List Categories and Criteria were consistently used for species and regions. Of the 1500 species, 220 were already assessed using IUCN criteria. The remaining taxa were assessed by global experts and this reflects the incredibly long author list on this paper (244 authors based on a quick count!). The results were unsurprising to most of us, but nevertheless disturbing: 59% of species were Least Concern, 5% were Near Threatened, 15% Threatened (Vulnerable, Endangered or Critically Endangered) and 21% were Data Deficient. To put this another way, one in five species are threatened with extinction and another one in five are data deficient. The paper identifies freshwater habitats, oceanic islands and tropical regions as containing the highest proportion of threatened species. Fig. 3. 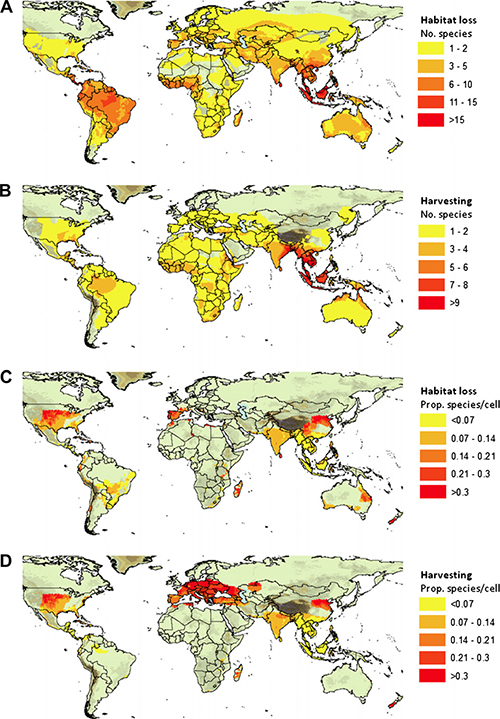 Global distribution of species affected by the two major threats to terrestrial and freshwater reptiles: (A) number of species affected by habitat loss from agriculture and logging and (B) number of species affected by harvesting. Controlling for species richness per grid cell, we expressed the number of species in elevated threat categories (CR, EN, VU, NT) affected by the threat in question as the proportion of the total species richness (all categories) per grid cell for (C) habitat loss from agriculture and logging and (D) harvesting. You can download a PDF of the paper with the supplementary material inserted at the end of the paper, on our publications link. Böhm, M., Collen, B., Baillie, J.E.M., Bowles, P., Chanson, J., Cox, N., Hammerson, G., Hoffmann, M., Livingstone, S.R., Ram, M., Rhodin, A.G.J., Stuart, S.N., van Dijk, P.P., Young, B., Afuang, L.E., Aghasyan, A., Aguayo, A.G., Aguilar, C., Ajtic, R., Akarsu, F., Alencar, L.R.V., Allison, A., Ananjeva, N., Anderson, S., Andren, C., Ariano-Sanchez, D., Arredondo, J.C., Auliya, M., Austin, C.C., Avci, A., Baker,.P.J., Barreto-Lima, A.F., Barrio-Amoros, C.L., Basu, D., Bates, M.F., Batistella, A., Bauer, A., Bennett, D., Böhme, W., Broadley, D., Brown, R., Burgess, J., Captain, A., Carreira, S., Castaneda, M.R., Castro, F., Catenazzi, A., Cedeno-Vazquez, J.R., Chapple, D., Cheylan, M., Cisneros-Heredia , D.F., Cogalniceanu, D., Cogger, H., Corti, C., Costa, G.C., Couper, P.J., Courtney, T., Crnobrnja-Isailovic, J., Crochet, P.-A., Crother, B., Cruz, F., Daltry, J., Daniels, R.J.R., Das, I., de Silva, A., Diesmos, A.C., Dirksen, L., Doan, T.M., Dodd, K., Doody, J.S., Dorcas, M.E., Duarte de Barros Filho, J., Egan, V.T., El Mouden, E.H., Embert, D., Espinoza, R.E., Fallabrino, A., Feng, X., Feng, Z.-J., Fitzgerald, L., Flores-Villela, O., Franca, F.G.R., Frost, D., Gadsden, H., Gamble, T., Ganesh, S.R., Garcia, M.A., Garcia-Perez, J.E., Gatus, J., Gaulke, M., Geniez, P., Georges, A., Gerlach, J., Goldberg, S., Gonzalez, J.-C.T., Gower, D.J., Grant, T., Greenbaum, E., Grieco, C., Guo, P., Hamilton, A.M., Hare, K., Hedges, S.B., Heideman, N., Hilton-Taylor, C., Hitchmough, R., Hollingsworth, B., Hutchinson, M., Ineich, I., Iverson, J., Jaksic, F.M., Jenkins, R., Joger, U., Jose, R., Kaska, Y., Kaya, U., Keogh, J.S., Köhler, G., Kuchling, G., Kumlutas, Y., Kwet, A., La Marca, E., Lamar, W., Lane, A., Lardner, B., Latta, C., Latta, G., Lau, M., Lavin, P., Lawson, D., LeBreton, M., Lehr, E., Limpus, D., Lipczynski, N., Lobo, A.S., Lopez-Luna, M.A., Luiselli, L., Lukoschek, V., Lundberg, M., Lymberakis, P., Macey, R., Magnusson, W.E., Mahler, D.L., Malhotra, A., Mariaux, J., Maritz, B., Marques, O.A.V., Marquez, R., Martins, M., Masterson, G., Mateo, J.A., Mathew, R., Mathews, N., Mayer, G., McCranie, J.R., Measey, G.J., Mendoza-Quijano, F., Menegon, M., Metrailler, S., Milton, D.A., Montgomery, C., Morato, S.A.A., Mott, T., Munoz-Alonso, A., Murphy, J., Nguyen, T.Q., Nilson, G., Nogueira, C., Núñez, H., Orlov, N., Ota, H., Ottenwalder, J., Papenfuss, T., Pasachnik, S., Passos, P., Pauwels, O.S.G., Pérez-Buitrago, N., Pérez-Mellado, V., Pianka, E.R., Pleguezuelos, J., Pollock, C., Ponce-Campos, P., Powell, R., Pupin, F., Quintero Díaz, G.E., Radder, R., Ramer, J., A.R., R., Rasmussen, A.R., Raxworthy, C., Reynolds, R., Richman, N., Rico, E.L., Riservato, E., Rivas, G., Rocha, P.L.B., Rödel, M.-O., Rodríguez Schettino, L., Roosenburg, Ross, J.P., W.M., Sadek, R., Sanders, K., Santos-Barrera, G., Schleich, H.H., Schmidt, B.R., Schmitz, A., Sharifi, M., Shea, G., Shi, H., Shine, R., Sindaco, R., Slimani, T., Somaweera, R., Spawls, S., Stafford , P., Stuebing, R., Sweet, S., Sy, E., Temple, H., Tognelli, M.F., Tolley, K., Tolson, P.J., Tuniyev, B., Tuniyev, S., Üzüm, N., van Buurt, G., Van Sluys, M., Velasco, A., Vences, M., Veselý, M., Vinke, S., Vinke, T., Vogel, G., Vogrin, M., Vogt, R.C., Wearn, O.R., Werner, Y.L., Whiting, M.J., Wiewandt, T., Wilkinson , J., Wilson, B., Wren, S., Zamin, T., Zhou, K. & Zug, G. 2013. The conservation status of the world’s reptiles. Biological Conservation 157:372–385.